We have an 18th century grade one listed building that has six letting bedrooms which are all on first and second floors, not suitable for people in wheelchairs or unable to manage stairs. There is parking on roadside outside front door and two car parks to the left of the property. On arrival we will can help with any luggage. Nearest train station is Penrith where you can get a taxi or we can arrange to pick you up. The property has a fire alarm system and smoke detectors, fire extinguishers in place on all floors and emergency lights. Smoking is permitted on the premises. We accept well behaved dogs that are allowed in guest room and lounge only. Check in time: any time after 3pm or otherwise arranged. Deposits required. Payments by cheque or cash only. 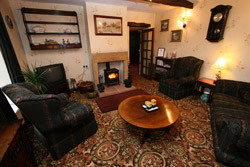 Dietary requirements catered for, please advice on booking. 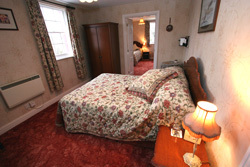 These rooms are both en-suite with double beds, wardrobes, dressing table, chairs, TV, hospitality trays. These rooms are also en-suite both with 1 double and 2 single beds, wardrobes, dressing tables, TV, hospitality trays & chairs. Room 5 has a shower, Room 6 has a bath. Twin beds, wardrobe, dressing table, TV, hospitality tray. One double bed and one single bed, en-suite wardrobe, dressing table. TV, hospitality tray, two chairs.